"Tests performed on the Surface Web demonstrated that private sellers GAO contacted on gun forums and other classified ads were unwilling to sell a firearm to an individual who appeared to be prohibited from possessing a firearm," Seto J. Bagdoyan and Wayne McElrath of the GAO's Forensic Audits and Investigative Service section said in a report on the investigation released in November. The investigation specifically targeted online sales by private sellers who do not have a federal firearms license and, in most states, aren't required to perform background checks on potential buyers. The investigators wanted to see if private sellers on otherwise legitimate online gun forums and marketplaces would break federal law by knowingly selling firearms to somebody who isn't allowed to buy them. 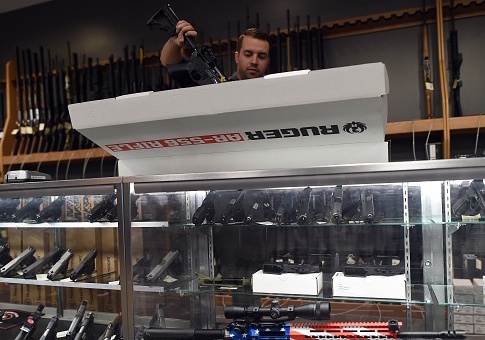 "The purpose of our Surface Web purchase attempts was to determine whether private sellers would knowingly sell a firearm to an individual prohibited from possessing one, as outlined by the Gun Control Act of 1968 (GCA)," Bagdoyan and McElrath said in their report. "Our agents used one of five scenarios based on a provision of the GCA when attempting to purchase a firearm. The scenarios involved overtly explaining why our agent was prohibited from possessing a firearm." The investigators targeted websites based on whether they hosted nationwide or regional ads, the number of ads they could find, the variety of guns available on the site, how easy it was to access the site, and input from outside organizations like the Bureau of Alcohol, Tobacco, Firearms, and Explosives. "To perform Surface Web testing, our agents accessed public gun forums and other classified ads where private nonlicensed sellers listed firearms for sale," the report said. "These forums and classified ads were identified from our meetings with ATF and third-party entities, and a review of available documentation." The GAO had originally planned to conduct 75 attempts at illegal purchases on otherwise legitimate sites but gave up after 72 straight failures. The investigation, first highlighted by the Daily Beast‘s Lachlan Markay, had better luck on a collection of websites known for criminal trafficking the GAO refers to as the "Dark Web." Investigators were able to make two gun purchases in seven attempts through the online havens for illegal activity. "Our agents successfully purchased two firearms from sellers we located on a Dark Web marketplace as a result of seven total attempts," the report said. "ATF officials stated that the Dark Web is completely anonymous and is designed to facilitate criminal activity online." The GAO was able to purchase one semi-automatic AR-15 from a Dark Web seller and one Uzi that was advertised as being capable of automatic fire. The agency said it forwarded information about the likely-illegal sales to appropriate law enforcement agencies for follow up. This entry was posted in Issues and tagged Gun Control. Bookmark the permalink.